The rise of “apps culture” reflects the transition of cell phones from voice communication devices to mobile computing devices. As cell phone use in general increases, wireless internet use is also on the rise, particularly among Hispanic and African-American adults.6 Fully 59% of adults are now mobile internet users, meaning they access the internet wirelessly via a laptop or cell phone. As mobile computing and internet use become the norm, cell phones are increasingly taking on functions once served by desktops and laptops. And for a significant portion of low income and nonwhite adults, cell phones represent their only means of accessing the internet and engaging in some online activities. Thus, many adults today expect (and need) their phones to serve a wide range of functions. As one might expect, adult cell phone users who embrace “apps culture” also tend to embrace other cell features and other technologies in general. These patterns are difficult to disentangle, as there are circular relationships between apps use and the use of the internet and other technologies. For instance, social media users (adults who use either social network sites such as Facebook or status update sites such as Twitter) are twice as likely as other cell phone users to have apps on their phones (59% v. 24%). Yet many cell phone apps enable social media use, and these apps are in fact among the most popular (see Part IV of this report). 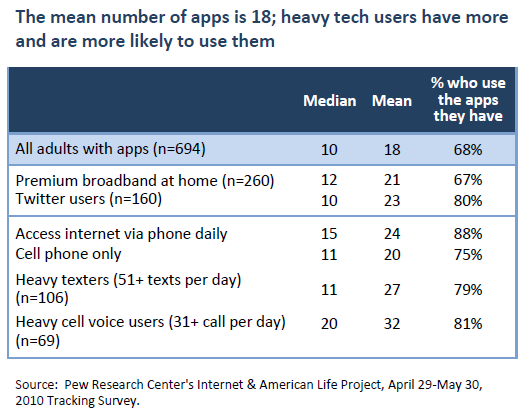 Likewise, wireless internet users are more likely than other online adults to be apps users. Yet downloading an application in and of itself requires wireless internet access, which would mean that apps downloaders are wireless internet users by default. Moreover, these relationships are even further complicated by the fact that not all cell-using adults recognize activities they engage in on their phones as app-enabled, when in fact they might be. Therefore, rather than pinpoint causal direction in these relationships, in this section we simply show the strong correlations between apps use and various online activities, cell phone activities, and technology use in general. As noted earlier in the report, 38% of cell phone users have purchased a phone with preloaded apps and 29% have downloaded an app themselves. About a quarter of adult cell phone users (23%) have both paid and preloaded apps on their phones. Not surprisingly, heavy technology users are more likely than other adults to both download apps and to purchase phones with apps. As the above table indicates, adult cell phone users who use the text features on their phones, and particularly heavy texters (those who send more than 50 texts on a typical day), are significantly more likely than other cell phone users to download apps. About four in ten texters (39%) have downloaded an app, a figure that drops to just 4% among adult cell phone users who do not text. Among the heaviest texters, those who send and receive more than 50 texts a day, 63% have downloaded an app to their phone. As one might expect, heavy technology users in general tend to have more apps on their phones than cell phone users who do not embrace other technologies. 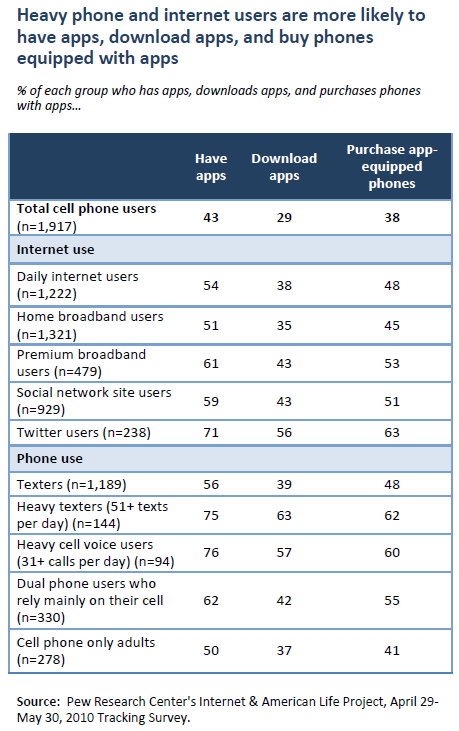 The table below shows that some of the highest reported mean numbers of apps are among heavy cell voice users and heavy texters. Cell-using adults who have premium broadband at home, those who use status update sites such as Twitter and adults who go online from their phones on a daily basis also report a higher average number of apps on their phones. These groups are also especially likely to report using the apps they have. 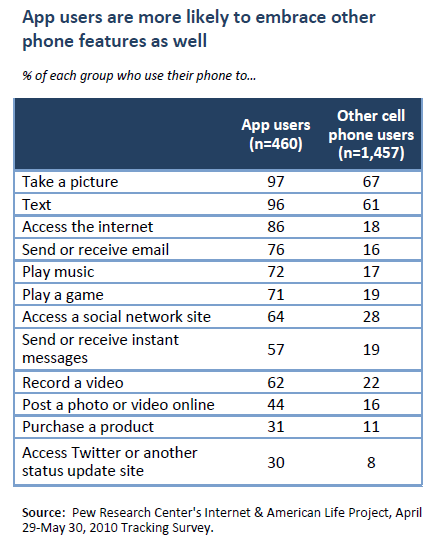 Overall, apps users are significantly more likely than other adult cell phone users to take advantage of every feature of their cell phone asked about in the survey, including email, texting, taking pictures, playing music, instant messaging, recording a video, playing a game, accessing the internet, purchasing a product online, and accessing social networking sites from their phone. Again, it is important to note that apps use and use of these other cell phone features are not mutually exclusive. 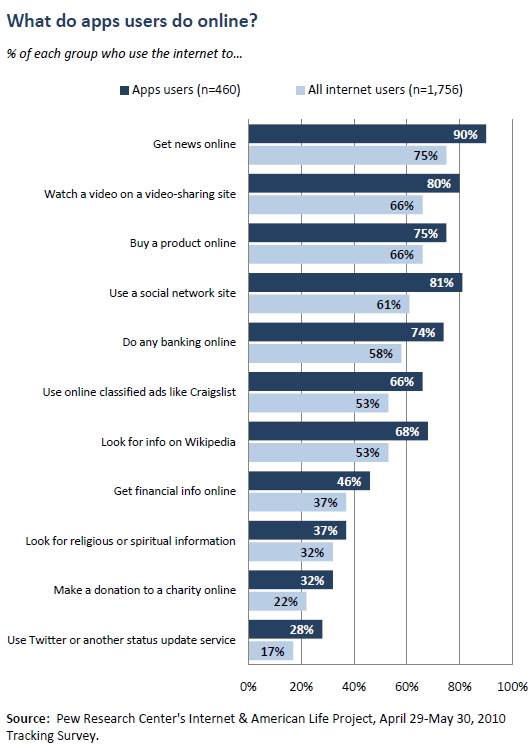 Many of these activities make use of apps, and apps that enable these activities are among the most popular downloads (see Part IV of this report). It is also important to note that these figures include adults whose phones may not be equipped to perform some of these tasks. Apps users are likely to have phones that are able to perform more of these functions, which explains, in part, their higher reported use of different phone features. Due in part to the web accessibility and increased engagement many apps provide, it is logical that apps users are more likely than other adults to engage in almost every online activity asked about in the survey. They are particularly likely to use social network sites such as Facebook and status update sites such as Twitter when compared with internet users as a whole.